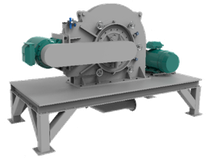 ECUTEC’s line of SIERRA pin mills forms the heart of a unique solution for the coating of ultrafine powders. Coating calcium carbonate with stearic acid is the most common application. Proprietary injector designs achieve a high degree of atomization of the coating fluid. The high tip speeds produced by the counter-rotating pin disks provide the high shear forces required for proper dispersion and uniform coating. 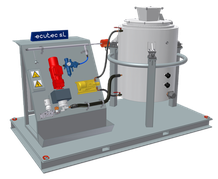 Each coating system is custom designed for the application and includes all auxiliary equipment such as weigh feeders, dosing tanks, pumps, fans, filters and advanced monitoring and control equipment to ensure efficient, consistent coating results.